This sharp, painful new play by Tom Holloway depicts the shared trauma of two people separated by 15,000 km. Mary is in Liverpool, still in the “horrible” house that she’s lived in for 60 years, surrounded by memories and mementoes of the baby who was taken away from her by the church. In Australia, that child Gerry is now middle-aged, struggling with a drink problem and a family life that is crumbling because of it. Gerry doesn’t know his distant mum is still alive until his daughter Sal gets through the tangle of bureaucracy and the lies the family were told about Gerry growing up as an orphan. This harrowing set-up reflects the real life situation of thousands of English kids who were relocated as part of the White Australia policy which ran from 1945 right up to 1968, the aim being to boost the “good white stock” as they called it. The reality for these children was often a series of halfway houses, dislocation trauma and abuse. In Forget Me Not, it’s not surprising then that Gerry gulps down wine by the glass-full, while Mary measures out the last days of her life in calming cups of tea. 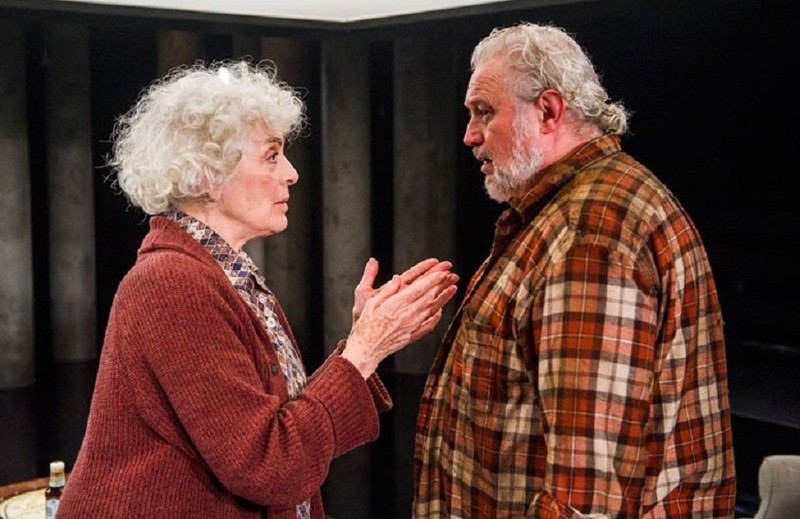 Holloway compacts their stories into a series of fraught meetings, the actors skilfully negotiating the misunderstandings and interruptions that largely make up the dialogue. Eleanor Bron as Mary is warm but tragically weak, while Russell Floyd as Gerry is awkward then aggressively spiky as he tries to adjust to each new revelation. Alongside them Sarah Ridgeway as Sal and Sargon Yelda as agency clerk Mark, add to the pressure as they try their best to help. The painful coming back together is presented with a bold vision by Steven Atkinson, the artistic director of HighTide Festival Theatre, with whom this is a joint production. At times that vision is a bit overwrought – the music especially with blasts of Handel and Freddie Mercury that do help to pace the story but feel increasingly melodramatic towards the end. Nevertheless, this is an emotional thump of a play that will make you glad you have family around you over Christmas and make you spare a thought for people who aren't so fortunate. Forget Me Not runs at the Bush Theatre until 16 January. Tickets £10-£20. Londonist saw this show on a complimentary ticket.